It’s really difficult finding places to experience for an affordable price in Italy. Since majority of us can’t keep secrets, I thought I’d follow along that trend and share something that I thought was valuable and worth leading people away from the tourist traps and supporting a small winery in the area. Just be sure to keep your eyes open because the entrance comes quick! Make sure to go in the first left, because the entry after is narrow and for the owners. 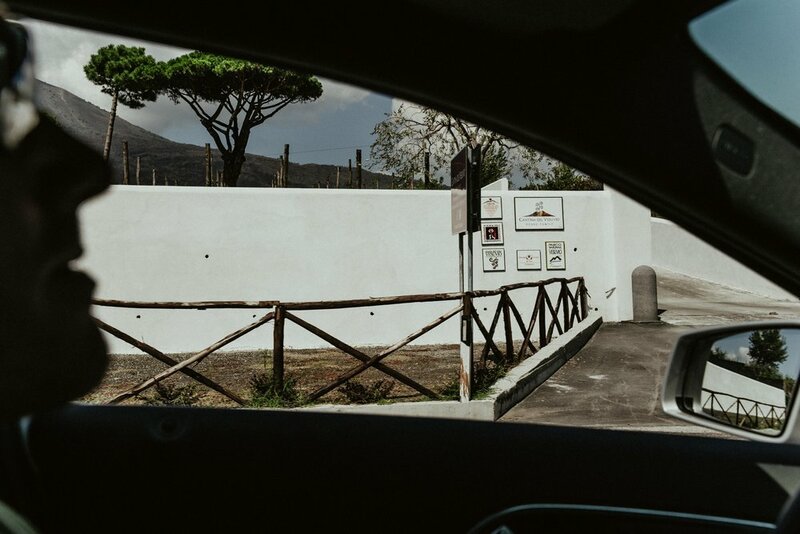 After spending a few hours “hiking” Mount Vesuvius (click here to read our blog about Mount Vesuvius), we ventured down the bottom for lunch which was planned last minute through Airbnb. The winery is called CANTINA DEL VESUVIO WINERY & VINEYARDS. This was our first booked “experience” and I was a little hesitant because I wasn’t sure what the quality would be. We took our chances finding something on the lower end, about $30, which offered a small tour of the winery, a three-course lunch, and a six-glass wine tasting. We were just wanting the wine tasting so everything else was a bonus. There are some things you should be aware of when going on this little adventure. You might not meet Giovanni, who is advertised on the ad to chat about the ins and outs of the winery and sharing his family’s history. Instead you may be greeted by the countless servers on the deck. Take your time eating but also be mindful about how long you booked your experience (usually for 2 hours). The servers come quickly to serve your glasses. Don’t be shy to ask them questions because they won’t chat too much otherwise. Get to the front of the group during the walk around the vineyard, otherwise you may struggle to hear your leader over the sound of trampled gravel and their accent. I know I missed some information because I couldn’t here. The tour itself is was probably less than 15 minutes. Haven’t won you over? Well, the amount of food alone could have been easily been over $40 per person in Amalfi or Positano. We had a lovely plate of bruschetta, casatiello bread (UM, the best bread ever), provolone cheese, salami and capocollo (cold dry meat). We graciously dipped our bread with their wine vinegar (and couldn’t help buy some for both ourselves and our hosts back “home”). Durum spaghetti with Piennolo Vesuvian tomatoes and basil was our second meal, which was served with a side of wood fired baked bread and olive oil (as to be expected). 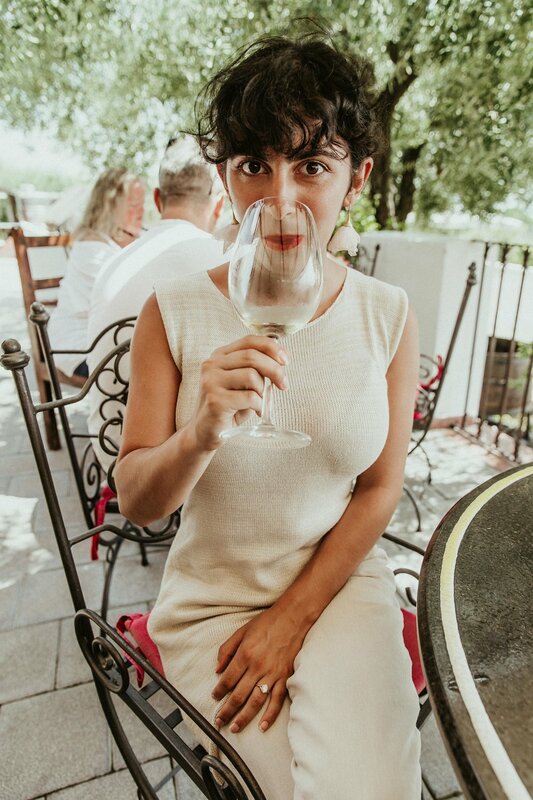 I mentioned six wines earlier because what they’ll pour your favorite from the group for a final tasting which isn’t advertised and was a sweet surprise. For dessert they served an apricot liqueur served on the side with a traditional Neapolitan pastiera pie which had ricotta cheese, grain, and candied fruits. Sounds like a Christmas dish you’d regretfully receive from your great grama, but this was bomb! I’m always hesitant with ricotta, especially knowing Dave got food poisoning from it, but this was very well made. I loved that all the wines paired beautifully with all our dishes. 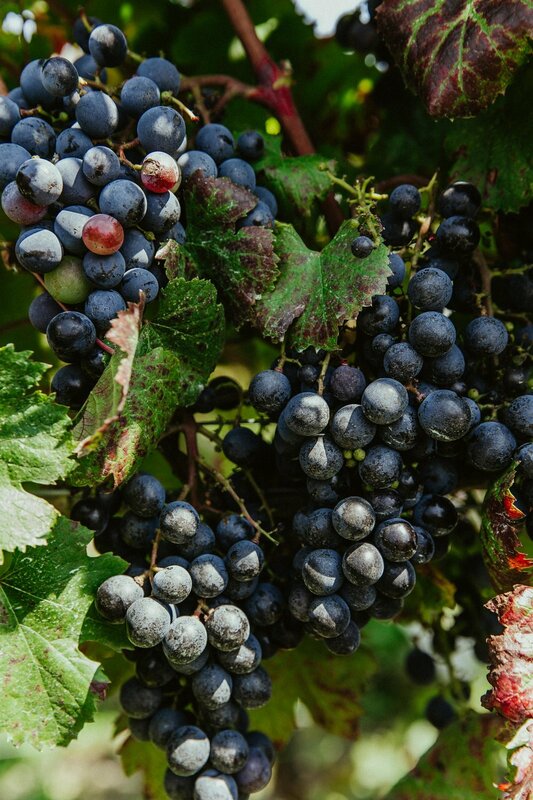 We ended up adventuring around the vineyard to explore the grape field a little more deeply, snag some pictures…and pluck off a few grapes. We felt rebellious, though we’re sure they know everyone who visits probably does this…and if not, we’re shitbags for it. I was just so curious how fresh they tasted in comparison to store bought in the United States. They were so plump and vibrant, we just couldn’t resist. We were greeted a few times at our table from the family who mentioned that they have 16 acres of land which is pretty small. Part of the reason why I enjoyed visiting was because we felt like we were supporting a small, local business. What I thought was interesting is how they treat the soil. They are certified organic, so you won’t find sulfites in their drinks. They don’t need to water their land because the volcanic soil retains moisture well. They also had rose bushes planted at the end of each row to determine whether or not their was a disease or bacteria in the soil. Essentially, the rose bush would show signs first before the grapes which gives them enough time to search and fix the problem. I’m sure you’ll find criticism on their reviews, but I like to put things into perspective with what I’m getting for pricing. Not too many places will be perfect, but I’d come back again if that says anything. The price is amazing for the quality of wine and food you receive. Even with turning and burning their tables, the meal was delightful and we know we can order from them online instead of needing to deal with bringing wine back through customs.